Complete the line by scribing from the other prick punch mark in the opposite direction. 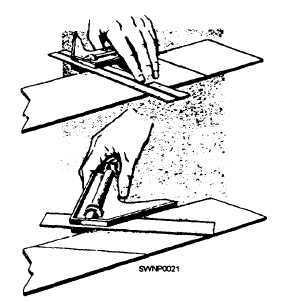 The FLAT STEEL SQUARE is a desirable tool for constructing perpendicular or parallel lines. In the method of layout, known as parallel line development, the flat steel square is used to construct lines that are parallel to each other as well as perpendicular to the base line. This procedure is shown in figure 2-2. Simply clamp the straightedge firmly to the base line. Slide the body of the square along the straightedge, and then draw perpendicular lines through the desired points. 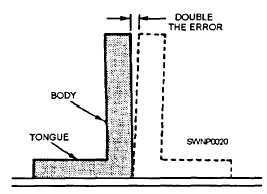 Before using the flat steel square or at least at periodic intervals, depending on usage, see that you check it for accuracy, as shown in figure 2-3. When the square is off, your work will be off correspondingly no matter how careful you are. Figure 2-2. - Using a swuare to cinstruct perpendicular and parallel lines. Figure 2-3. - Checking a square for accuracy. delicate instruments and are of little value if you handle them roughly. Store your squares properly when you have finished using them. Keep them clean and in tiptop shape, and you will be able to construct 90-degree angles, 45-degree angles, and parallel lines without error. To construct angles other than 45 degrees or 90 degrees, you will need a PROTRACTOR. Mark the vertex of the angle of your base line with a prick punch. Set the vertex of your protractor on the mark and then scribe a V at the desired angle (assume 700). Scribe the line between the vertex and the point located by the V, and you have constructed an angle of 70 degrees. When you locate a point and mark it with the PRICK PUNCH, be sure to use alight tap with a small ball peen hammer, ensuring it is on the precise spot intended to mark. The smaller the mark you make (so long as it is visible), the more accurate that mark becomes.